HomeWho is known as “The Children’s President” in South Korea? If you have been to South Korea, you may often come across an animated character wearing a yellow aviator’s helmet (with the letter “P” on it) and orange googles. He is called Pororo (뽀로로), a little penguin living with his friends in a snow-covered village in a TV animation produced by Koreans. He is so popular among kids in South Korea that he is known as “The Children’s President”. In this post, let’s talk about this animated character to better understand him. You may hear the opening theme song of the Pororo animation by clicking this link. The Pororo animation debuted in 2003 targetting at children aged 4 to 7 and the animation’s Season 6 series is currently being aired. It has short episodes of 5 to 11 minutes’ long, and parents of children aged 4 to 7 help come up with simple stories from the kids’ viewpoint. The animated characters are of vivid colours which appeal to kids. Moreover, the animation is regarded as reflecting the everyday life of the children with educational themes like importance of helpfulness and cooperation. Each of Pororo and his friends has his/her own personality. For example, Pororo is a curious and noisy penguin, his girlfriend Patty is a sociable and outgoing penguin, Poby is a kind, reliable and optimistic bear, and Eddy is a brilliant but pig-headed fox. The characters are not perfect in the animation, and they may fight with each other, play tricks on their friends, get angry or greedy, and even make a mess – they are like most kids so the animation can easily connect to the kids. The Pororo animation is not just an animation for kids but has great significance to South Korea. First, the Pororo animation is a huge success in Korean animation’s history. It is the first famous animated character developed by Koreans. You should have no doubt about the popularity of Pororo in South Korea since you can see him everywhere. There are a variety of Pororo merchandised products like stationery, clothes, coffee mugs, toys, books, etc. It is said that sale of stamps bearing Pororo’s image was greater than those bearing the image of Yuna Kim, the Olympic figure-skating champion. Second, the Pororo animation is also popular internationally. Pororo and his friends are not human beings so are “neutral” characters with no specific cultural background. This helps the animation appeal to an international audience. The Pororo’s animation has been exported to over 100 countries and is regarded as one of great successes of K-animation. Third, the Pororo animation started as a cooperative effort between North Korea and South Korea. Although its production company, Iconix Entertainment, is a South Korean company, some North Korean technicians trained by the company in North Korea participated in the production of the first two seasons of the TV series of the animation between 2002 and 2005. This cooperation was due to the landmark peace pact signed between North Korea and South Korea in 2000 but ended due to the deterioration of relationship between the two. Last but not least, the Pororo animation has played a pioneering role in the Korean animation games and theme park industries. On the games front, “Pororo Games” were the first Korean games played via IPTV. The games are designed for children aged 4 to 7 as a comprehensive tool for stimulating intelligence, nurturing peer coordination skills and fostering intimacy with parents. ”Pororo Magic Puzzle“ was the first mobile game featuring Pororo and was released through the popular Korean messaging platform, Kakao. Pororo and his friends are also added as characters in other mobile games. On the theme park front, in April 2011, the Pororo theme park opened in 7 locations (including Seoul) in South Korea simultaneously. Unlike other theme parks, Pororo theme park combines playground and theme park inside a mega shopping mall, and provides “edutainment” (i.e., combing education with fun through games, lessons and performances). 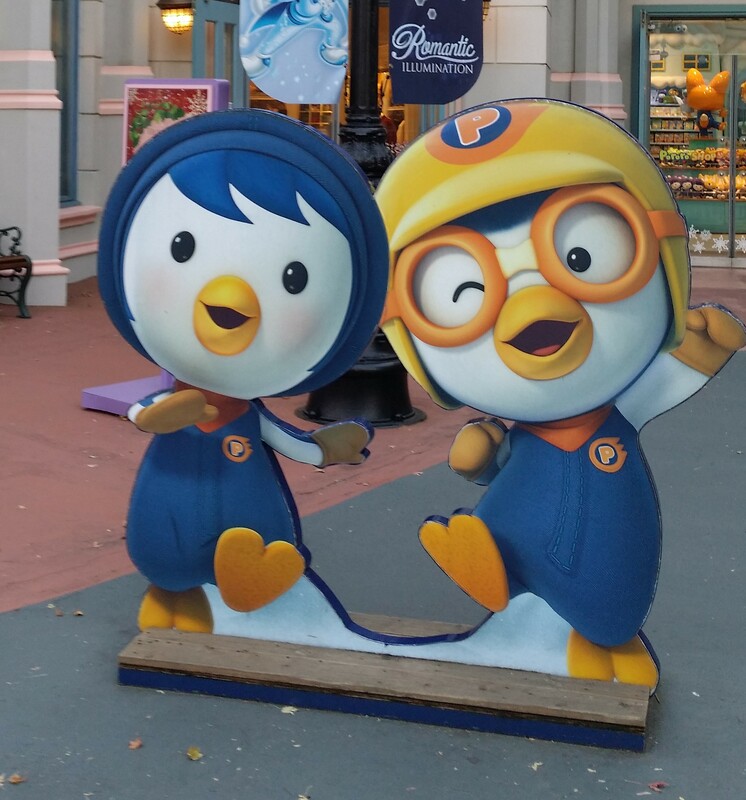 You can have a quick tour of one of the Pororo theme parks by watching this video. Next time when you see Pororo, apart from finding him cute, you may also appreciate his significance to South Korea. ← Singleton no longer a bad thing in South Korea!